There was no obvious single reason for this slowdown, but some important factors should be noted. First, Russia’s working-age population had started to decrease, which automatically slows down GDP growth, ceteris paribus. Second, Russia’s fixed capital investment remained low, between 21% and 22% of GDP after the global financial crisis. While this would not be problematic for a country like, say, Germany, Russia’s investment ratio remained much below rapidly growing emerging market countries. Third, growth in productivity had become much slower already before the global financial crisis (Voskoboynikov and Solanko, 2014). Last, the price of oil remained high, but it did not increase as it did between 2000 and 2008. Deryugina and Ponomarenko (2014) use a large Bayesian VAR model to assess the relative importance of various macroeconomic factors in explaining the evolution of Russia’s GDP. They find that the oil price together with demand from the EU are enough to forecast and explain most of the short-run movements in Russian GDP. Rautava (2013) notes a similar dependence on the price of oil. Even more interestingly, he notes that Russia’s trend growth halved to approximately 2% after the global financial crisis. It is difficult to overstate the importance of energy prices for the Russian economy. Crude oil, oil products and natural gas brought 70% of Russia’s export revenue in 2014, and the energy sector provides the Russian Federation with more than 50% of its tax intake. 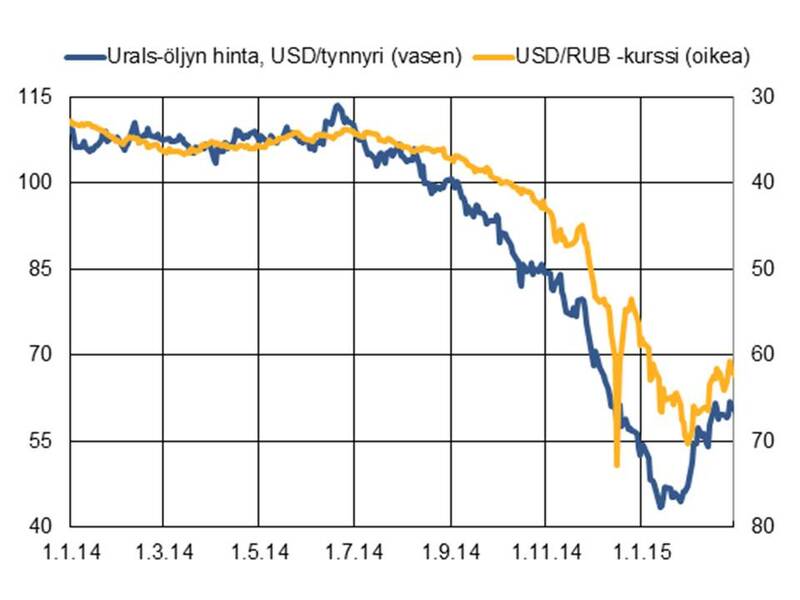 Figure 2 illustrates the tight connection between the price of oil and Russia’s exchange rate. Even after the introduction of sanctions in July, the Russian currency and financial markets remained relatively calm, but the rouble started its steep depreciation when the price of oil plummeted. Connection works in the other direction as well, of course. When the price of oil stabilized and recovered somewhat in February and March, 2015, the rouble reacted in the same direction as well. Unfortunately, Russia’s long-run growth prospects are not very rosy either, especially in comparison to the development in the recent years. We know very well about the evolution of the working-age population during the next 20 years, as almost all people coming into working-age have already been born. According to the UN prediction, Russia’s working-age population will decline from 90.7 million in 2015 to 78.7 million in 2035, which translates into -0.7% change annually on average. Even if one assumes that the capital stock will grow somewhat – say by 0.3% per annum, which is higher than recently – for the next twenty years, and total factor productivity also rises at a relatively rapid – but decelerating – pace, Russia’s GDP growth will be below 2% for the next twenty years (Table 1). This is clearly below what Russians have become used to in recent years. Also, Russia’s share of global GDP continues to decline. Moreover, Russia’s growth needs to be driven by total factor productivity. Voskoboynikov and Solanko (2014) estimate that it grew by 2.5% per annum between 1995 and 2008. 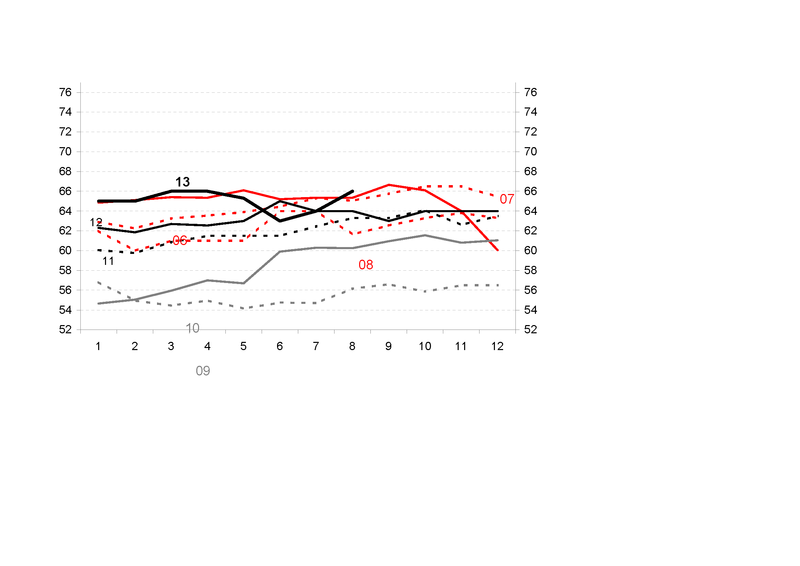 Therefore, keeping Russia’s growth relatively fast at higher income levels might be difficult. Deryugina, Elena and Alexey Ponomarenko (2014). A large Bayesian vector autoregression model for Russia. BOFIT Discussion Paper 22/2014. Rautava, Jouko (2013) Oil Prices, Excess Uncertainty and Trend Growth – A Forecasting Model for Russia’s Economy. Focus on European Economic Integration. Q4/13, Oesterreichische Nationalbank. Voskoboynikov, Ilya and Laura Solanko (2014). When high growth is not enough: Rethinking Russia’s pre-crisis economic performance. BOFIT Policy Brief 6/2014. How fast can Russia grow in the future? During the boom years of 2000-2007 Russian economy grew on average by more than 7% p.a. While the global economy also expanded vigorously, Russia’s growth was boosted further by ever-higher oil prices and productivity improvements especially in the services sector. Russia’s rapid GDP growth meant that Russians’ average standard of living also increased during this time, and by 2008 per capita GDP (at purchasing power parities) was 34% of the corresponding level in the US from 21% in 2000. Partly this rapid growth was a rebound from the economic crisis of 1998, but growth was also helped by restructuring of the economy towards services, which were very much underdeveloped during the Soviet times and early years of the economic and political transition. Moreover, productivity growth in the services was also fast, especially in the high-skill sectors such as financial intermediation and business services, which is natural given the relatively low starting level. However, growth during the boom years was not only driven by productivity improvements. According to a recent Discussion Paper published by the Bank of Finland Institute for Economies in Transition (Marcel P. Timmer and Ilya B. Voskoboynikov: Is mining fuelling long-run growth in Russia? 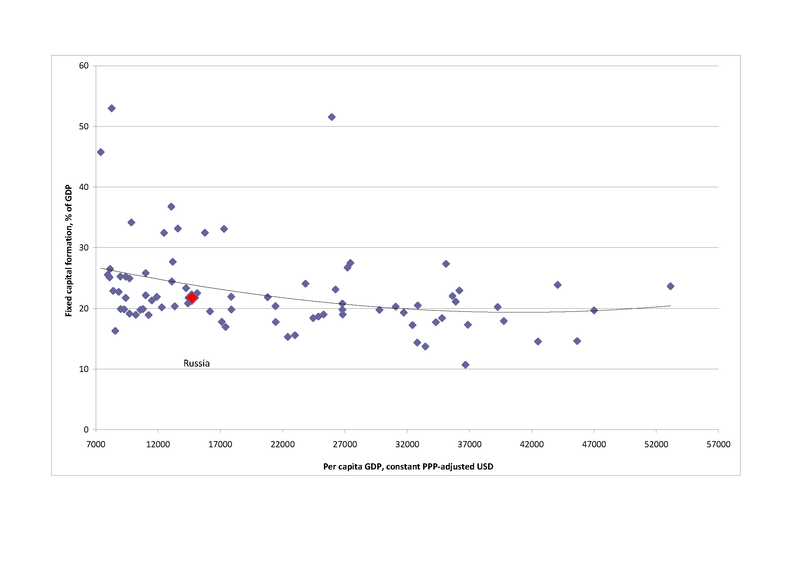 Industry productivity growth trends since 1995, BOFIT DP 19/2013, http://www.suomenpankki.fi/bofit/tutkimus/tutkimusjulkaisut/dp/Pages/dp1913.aspx) growth in the capital input has also accounted substantially to the growth in value-added. Moreover, growth in labor input has accounted for almost equally large share of value-added growth. At the same time many sectors where productivity growth has been very low, such as mining, have been able to increase their share of the economy, as they have been able to attract more capital and labour. In 2009 Russian economy suffered from the global financial crisis, but its post-crisis growth has been clearly slower than many expected, even though the price of oil soon returned to over $100 per barrel. 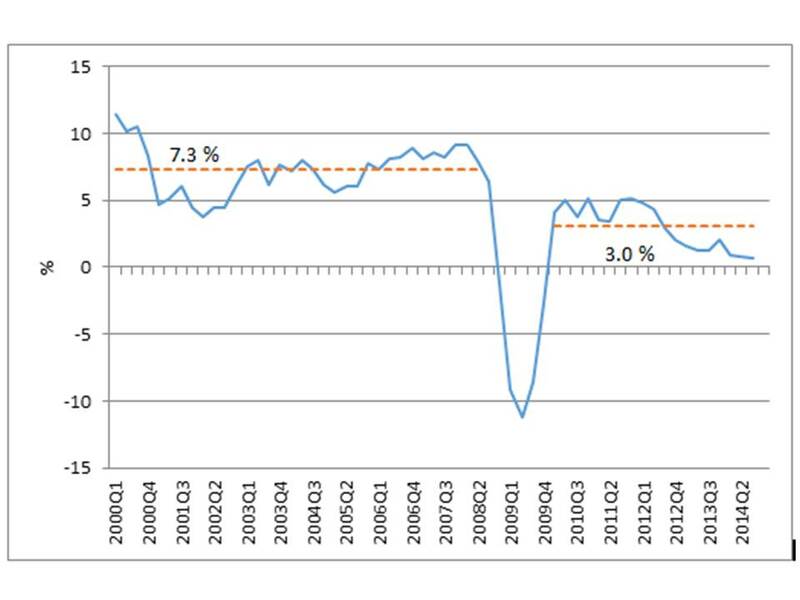 While the average GDP growth between 2010 and 2012 was 4%, growth continued to decelerate. In late 2012 and early 2013 quarter-on-quarter growth was practically non-existent. While the slowdown in growth has partially been cyclical, it is also a sign of clearly lower growth in the potential output. First, working-age population is already declining, and at the same time unemployment is very low. Officially the unemployment rate is around 5%, which in practice means full employment. Unless retirement age is increased soon, labor supply continues to decline, which will have a negative effect on future growth. Second, investments are also declining. Between 2010 and 2012 the average share of gross fixed capital formation in GDP was 21.8%. This is below the average investment ratio of other middle-income countries (see Figure 1), many of which are currently growing faster. Moreover, during the first half of 2013 investments actually declined year-on-year, and especially large energy as well as infrastructure companies cut back their investments. At the same time capacity utilization rates are even higher than during the boom years of 2006 and 2007 (Figure 2). This tells us that Russian companies do not view their future prospects favorably, and the large capital outflows basically tell the same story. During the past quarters net capital outflows have averaged some 2.5% of GDP. It is noteworthy that even relatively high oil prices have not been enough to boost Russia’s growth in the recent quarters. It seems that the uncertain global environment and Russia’s own well-known problems with business environment are hindering investments. It is especially noteworthy that Russian companies and investors are deeming investments into Russia lacking when taking into account the expected profits and perceived risks. The aforementioned factors have led many analysts inside Russia and outside it to drastically reduce their estimates of Russia’s long-term growth potential. Many of the estimates seem to cluster between 2.5% and 3% p.a. While this is still quite respectable in comparison to many EU countries, it will mean substantially slower increase in incomes and delayed convergence with the OECD countries. Also, slower growth may at some point be in conflict with the many fiscal responsibilities of the public sector.